WBA welterweight champion Marcos Maidana (35-3, 31 KO’s) is going to need to throw the rule book out the window on May 3rd for him to beat Floyd Mayweather Jr. (45-0, 26 KO’s) in their pay per view clash on Showtime from the MGM Grand in Las Vegas, Nevada. Maidana is going to need to do everything he can to win this fight, including bending the rules in order to make give himself a chance to win. Maidana doesn’t match up in the speed department or the skills with Mayweather. He also doesn’t have Mayweather’s vast experience both as a professional and as an amateur. Maidana has a couple of things going for him in this fight and that’s his power and his rough house style of fighting. Maidana is the stronger and with his ability to turn his fights into physical affairs where anything goes, he has a chance of getting to Mayweather and possibly hurting him. 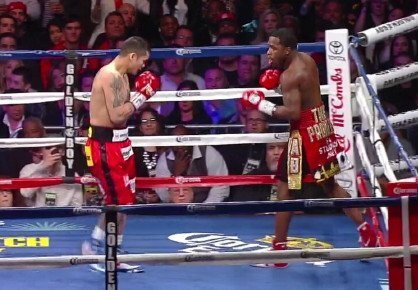 Mayweather has the same shell defense that Adrien Broner unsuccessfully used against Maidana last December, and that style is something that might not work for Mayweather in this fight. He’s got to change the way he fights, so you can count on Mayweather going into the shell defense on May 3rd and trying to get as small as he can to avoid Maidana’s furious bombardment. Mayweather can’t throw a lot of punches, especially now at this point in his career. Even when he was younger, Mayweather was the type of fighter who would use his hand speed to pot shot his opponents. What worked for him back then to avoid shots was his foot movement. Mayweather was a very good mover around the ring, and this enabled him to stay out of the way of the shots for most of his opponents. Occasionally there would be someone like Jose Luis Castillo who was good enough to cut off the ring and force Mayweather to brawl, but those kinds of fighters were few and far in between. Maidana will need to come out as fast and furious as he did in his recent win over Broner for him to get to Mayweather in this fight. He cannot let Mayweather get into a rhythm in the first part of the fight, because once Mayweather starts dominating an opponent, he gets a lot better because the crowd gets him motivated with their cheering for him and he seems to fight at a higher level. Maidana can take the crowd out of the fight immediately by jumping on Mayweather and shooting for a quick 1st round knockout. Maidana has got to make Mayweather fight all out in the opening round, and try to get him to use up as much energy as possible. Mayweather is 37 years old and Maidana can make him show his age by getting him to fight harder than he has for over a decade. Miguel Cotto pushed Mayweather a little in their fight in 2012, but Cotto didn’t have the engine to force the kind of pace to beat Mayweather. Maidana does have the stamina to make it that kind of a fight, and that’s really going to be his only chance to try and win this fight.